Pont d'Ivry en bois, sur piles en pierre, traversant la Seine près du confluent de la Marne. Détails pratiques sur ce pont. Projet, exécution, écritures, concession à terme. 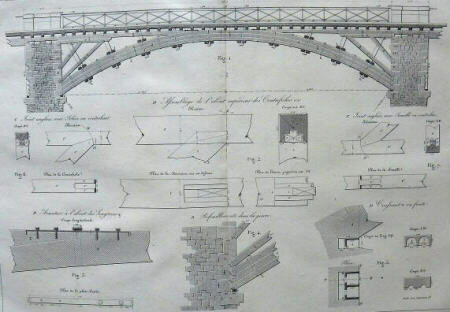 Description of a large laminated-timber bridge in France, a technique introduced by Wiebeking in Germany in the first decade of the 19th century and developed by Emy in France during the 1820s. Emmery's structure, which crossed the Seine at Charenton, had five arches with a central span of 23.75m, two flanking spans of 22.5m and two shore spans of 21.25m. The arches owed more to Wiebeking, who used thick timbers, than to Emy, who made up his arches of very thin planks. Emmery gives a detailed account of all aspects of the construction of this fine bridge, describing the founding of the piers and abutments, the method of bending the timbers under steam followed by the assembling and bolting together of the laminates (including a description of the preparatory experiments), the lifting of the pre-fabricated arches into place, the fitting of the decking which was partially covered with metal plates to prevent wear etc. The bridge was opened in 1829. Although there were earlier laminated timber bridges in France, notably that of Navier at Choisy, this is by far the most comprehensive description of the building and erection of this type of structure and the labour involved in fabrication. 4to text vol, small folio atlas. (viii) + 304pp ; title and 18 double-page engraved plates. Quarter calf.